Welcome to the Harper family genealogy site. I've had an interest in our family ancestry for many years, but it has only been in more recent years that the resources have been available online to research our families. My main interest has been in the genealogy of my mother's family - the Harper and Trew families who lived in Riddells Creek, Warracknabeal and other places in Victoria, Australia. It has led to many interesting discoveries and several intriguing mysteries. In 1841 Andrew Harper and his wife, Maria (nee Gleghorn) emigrated from Templepatrick, Ireland and arrived in Australia on a ship named ‘Marquis of Bute‘. They were accompanied by their three young boys – Paul (6), Samuel (4) and Henry (9mths). Maria Harper died tragically at the age of 46, having burned to death in her tent in Creswick. 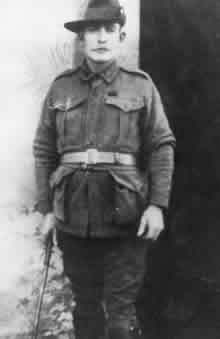 Samuel Cleghorn Harper and his wife Hanorah (nee Ryan) settled in Riddells Creek, Victoria (near Gisborne) and had 15 children, including William James (aka Wilfred Eric) pictured left in WWI uniform. Samuel Trew, a brickmaker from Essex England, came to Victoria in 1852. He married Charlotte Moorse in 1855 and they had one daughter and three sons. After arriving he continued in the brickmaking trade in Geelong, Shelford, Camperdown, Portland, Coleraine, Sandford, Harrow, Horsham, Murtoa and Warracknabeal.